I am hugely excited to be in Brussels for the launch of our biggest ever campaign: to end the cage age. Today we will stand shoulder to shoulder with more than 120 other organisations from 26 countries – our biggest ever coalition – to launch a shared European Citizens Initiative (ECI), which calls for an end to all cages for farm animals throughout the European Union (EU). It’s important to know that an ECI is not just another petition. It is more than that. It is a mass petition mechanism by which Europe’s citizens call on the European Commission to propose legislation. One that puts a legal requirement on the Commission to respond. And what’s more, it will give us the right to present the ECI at the heart of decision-making in Brussels: to the European Parliament. To be officially accepted, we need to get a million signatures across Europe within a year. I know with your fantastic support, we will soon have more than a million voices calling for an end to the cage age. For an end to this shameful chapter in history where countless millions of farm animals are consigned to a life of misery. We all have our own motivations for doing more for farm animals. It may be something we’ve seen on TV or on social media. A book we’ve read. Or perhaps seeing first-hand the reality of cage misery. 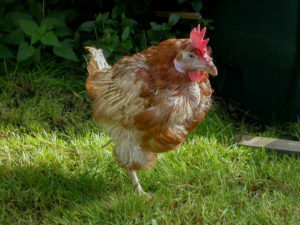 One memory that motivates me is of Huckle, a hen that my wife, Helen and I rescued from a battery cage. She arrived in a cat basket. We laid the basket on the lawn and opened the front. This little hen was facing an alien environment. All she had ever known was a darkened shed and a cage so small she couldn’t stretch her wings. For a while, nothing happened. Then out of the basket appeared a toe… then a foot… Then, wide-eyed and apprehensive, she started to do something she’d never done before: walk. She eventually made her way along the entire length of the garden, then back again and even disappeared into our cottage, where she peered out of the window at bemused passers-by! However, her previous life in a cage meant her immune system was shot to bits; after six months, she died. At least we were able to give her the life she’d never had. Anyone, who has kept hens knows they are all individuals with their own characters, personalities, likes and dislikes. It’s simply wrong to deny them all that makes life worth living. It’s time to respect animal sentience and end all cages for good. 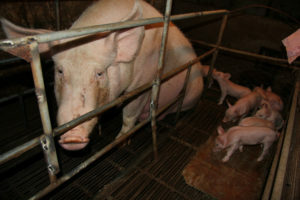 A million signatures on our ECI will show that people want action to end farm animal suffering. This massive campaign is our opportunity to not only end cage cruelty for hens, but also for hundreds of millions of pigs, calves, rabbits, quail, ducks and geese. We’re launching the ECI in the European Parliament before hosting events in cities across the EU, including in France, Spain, Greece and Poland. We have an exciting year ahead. Please help us end the cage age. Spread the word. Sign up today.